Make This yummy stacked enchilada. Happy Cinco de Mayo! It seems like forever since we’ve done a recipe, but wait no longer. This month, Always Uttori Food celebrates Cinco de Mayo with stacked enchiladas. While I’m not Latina, I was born in Texas, so Tex-Mex is a major comfort food for me. It’s a cuisine our family prepared frequently during my childhood years, but if I had to pick a particular dish as a favorite, my grandma’s stacked enchiladas would win, hands down! As a warning, this is not the recipe to make if you’re looking for something quick and easy. A lot of preparationgoes into the process, but once the prep work is out of the way, the actual cooking is pretty simple. As an added plus, it’s a recipe that requires no baking. If you’re a fan of Tex-Mex, stacked enchiladas are well-worth the effort. So, give it a try, and let me know what you think. 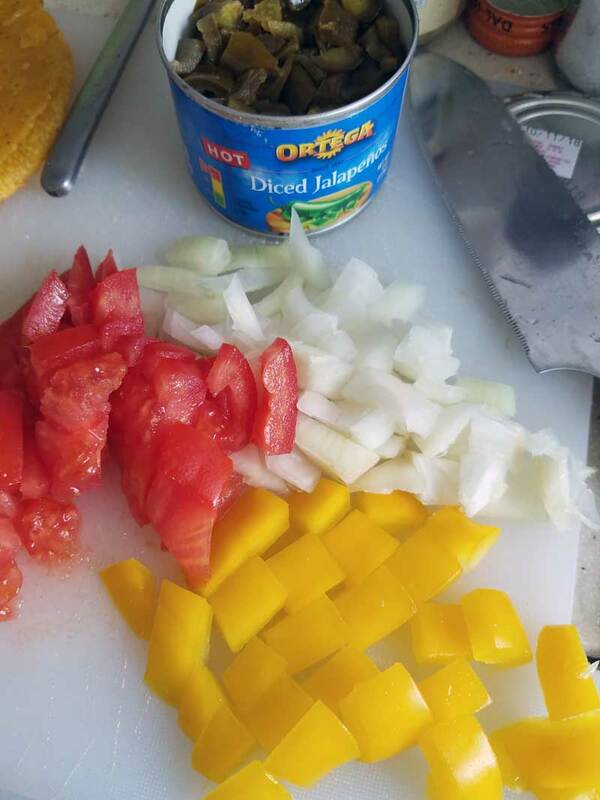 Dice the green onions, the rest of the large onion, fresh tomatoes, avocado, jalapenos, and cheese (if using) and set aside for garnish. In a large pan, brown the beef over medium heat with the onions and garlic until no pink remains. Drain the fat. Add salt and pepper to taste. 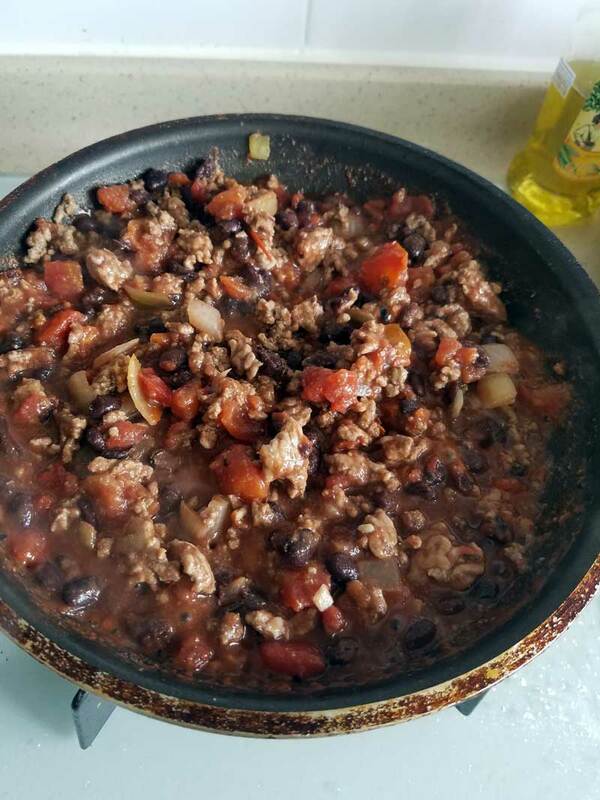 Rinse the black beans and add to the beef mixture along with the diced canned tomatoes. Let simmer over medium-low heat. While chili mixture is simmering, heat 1 tsp of oil in a pan. 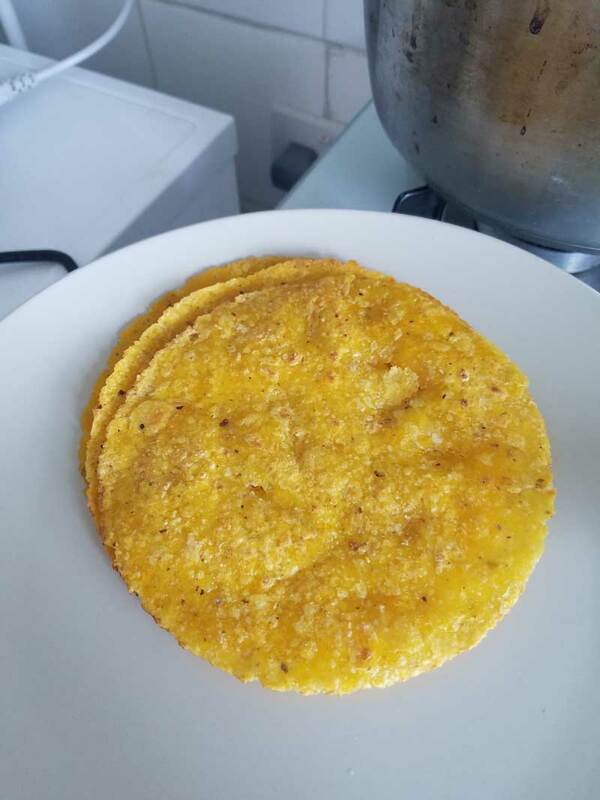 Cook corn tortillas about 4 minutes on each side, or until slightly crispy. When tortillas are done, cover foil to keep in heat. In a wide skillet pot, heat 3 TBSP oil over medium heat. Sauté the garlic (if using fresh), if using garlic powder, mix the cornstarch, chili, salt, and cumin together in a small bowl while the oil heats. 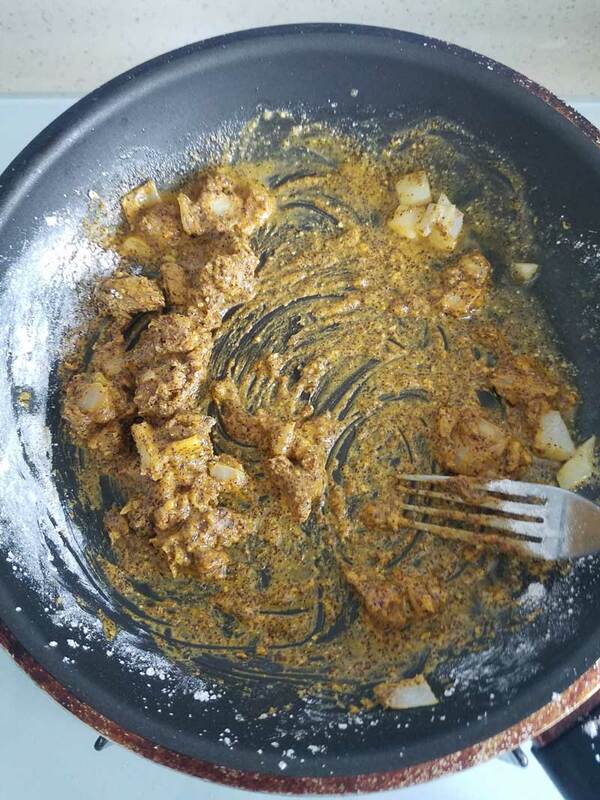 When the oil is heated through, add the cornstarch mixture and stir constantly, until the mixture has browned (It’s like a chili powder rue). 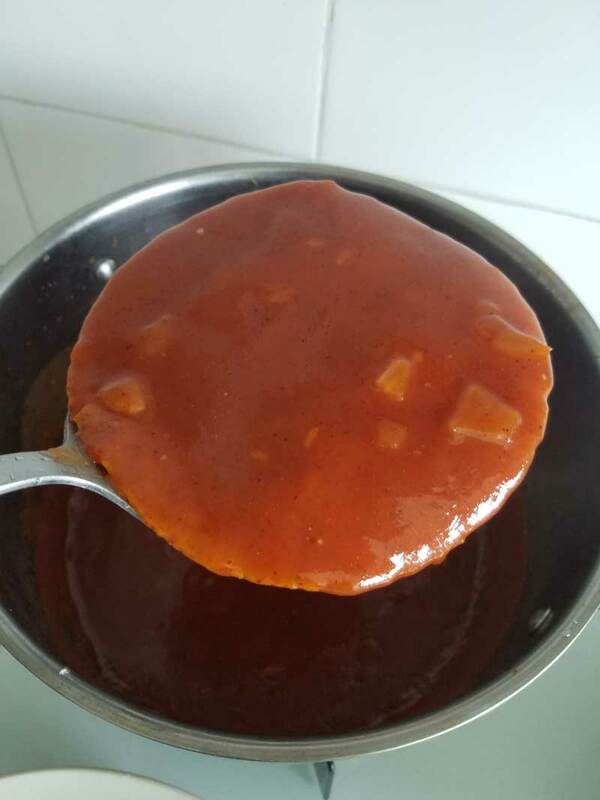 Once the cornstarch mixture has browned, add the tomato sauce mixed together with cup of water. Let simmer, stirring until it has thickened. When the sauce is ready, place one corn tortilla at a time into the sauce, coating both sides. Use a spatula, or rubber-tipped tongs, to remove the tortilla from the skillet and place on a plate. It will be somewhat fragile. Now, it’s time to stack. Spoon an even layer of the meat and bean mixture onto the tortilla. Add any of the toppings from the garnish that you want. 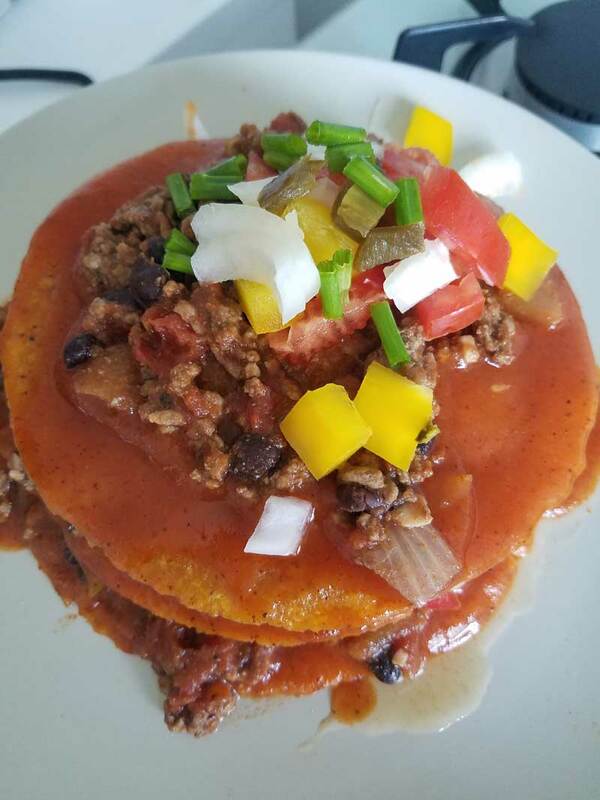 Dip another corn tortilla into the sauce and repeat the process until the enchilada is stacked as high as you desire. Repeat for other enchiladas. When you’re finished, it’s time to enjoy this wonderful dish, and celebrate the ideals of freedom. Lightly fry the corn tortillas and set aside until all are done. The meat should be browned with no pink showing. Dice all the toppings you’ll use for garnish.